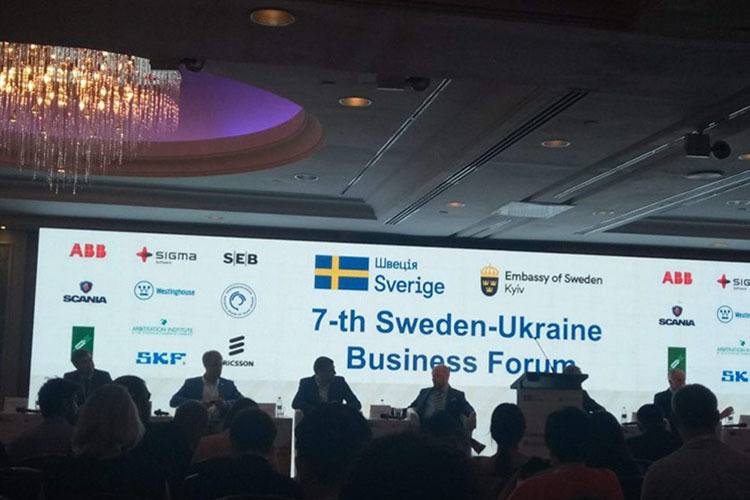 On June 14, 2018 the 7-th Sweden-Ukraine Business Forum was organized with the support of Embassy of Sweden in Ukraine and the Ukrainian Chamber of Commerce and Industry. The forum had both “public” and “private” features: issues of state favoring foreign investments in the Ukrainian economy were discussed; with the support of the Swedish Trade Council and the Export Promotion Office (Ukraine) a workshop aiming at stimulating export of Ukrainian goods to the EU and, particularly, to Sweden was held; the Arbitration Institute of the Stockholm Chamber of Commerce presented itself as one of the most popular platforms for international dispute resolution among European and Ukrainian entrepreneurs. On the other hand, the biggest Swedish companies who work in Ukraine, that are one of the most significant investors in its economy, had the opportunity to promote their businesses. The following companies could be seen there: ABB specializing generally in the field of industrial technologies focused at the business forum on its leadership as a manufacturer of charging for electric vehicles, which allows to fully charge an electric car in 20 minutes instead of 2 hours; Scania that is one of the most advanced truck companies; Grain Alliance which operates in agribusiness and cultivates more than 56 000 hectares and that is currently actively investing in processing industry; Ericsson working in communications and digital technologies; Westinghouse that is a world leader in innovative nuclear technology, which supplies Ukraine with the majority of nuclear reactors (9 out of 15), as well as nuclear fuel; SKF, a manufacturer of bearings, lubrication systems, etc., that has its own plant in Lutsk, with the great part of its products being exported; Sigma, a company providing IT consulting services for industrial companies, telecommunications and advertising, etc. So, despite the difficulties of the economic situation in Ukraine, Swedish businessmen “sell themselves”, they are looking for partners in Ukraine and are optimistic about doing business in Ukraine. Jurvneshservice has long been working with the Swedes, in particular Volvo, consulting on leasing tractors, recognition and enforcement of foreign arbitral awards in Ukraine, as well as debt collection, so our lawyers see a good sign in the interest of the Swedes in Ukraine.